Katie is on the verge of her Rumspringa, the time in Amish life when teenagers are free to experience non-Amish culture before officially joining the church. But before Rumspringa arrives, Katie’s safe world starts to crumble. It begins with a fiery helicopter crash in the cornfields, followed by rumors of massive unrest and the disappearance of huge numbers of people all over the world. Something is out there...and it is making a killing. Unsure why they haven’t yet been attacked, the Amish Elders make a decree: No one goes outside their community, and no one is allowed in. But when Katie finds a gravely injured young man lying just outside the boundary of their land, she can’t leave him to die. She refuses to submit to the Elder’s rule and secretly brings the stranger into her community—but what else is she bringing in with him? The Hallowed Ones brought me into a World of the unexpected, where opposite ends of the spectrum collide. A quiet little Amish community is about to meet a horrific evil that puts their lifestyle, beliefs, and lives in jeopardy in this dark coming of age tale. It was a hard book to put down and became an extra appendage over the last 24 hours. The creatures were brutal, merciless, and will make you want to sleep with your lights on. Katie was an interesting and believable character who matured as the story progressed. She was rebellious, brave and wasn't going to blindly fall in line just because she was told to do so. She knew how to think for herself. She had heart. I thoroughly enjoyed her character. This story brought out your emotions. I had full fledged anger towards the arrogance of the Elders, especially the Bishop. He needs a good kick in the shins. For me, there were some overall religion issues that brought the book down to a four star rating. Otherwise, I was fully immersed within the pages and stared at it blankly for a few minutes when it ended hoping for more pages to magically appear. I don't know if there is a sequel in the works, but I will definitely be standing in line waiting for it if there is. Laura Bickle has a new fan. Pre-Order Now! 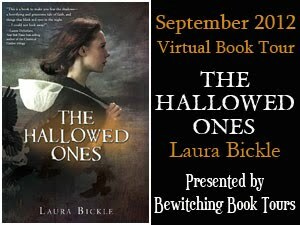 To learn more about Laura Bickle and her books, visit her website. You can also find the author on Facebook and Twitter. Don't forget to check out my interview with the author! 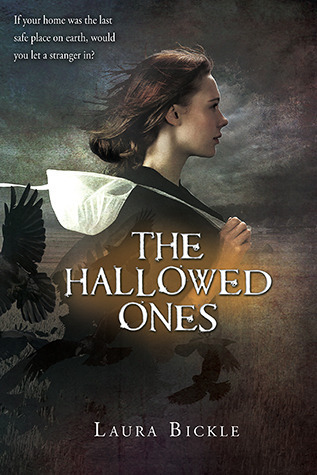 The Hallowed Ones was provided to me by the publisher through NetGalley. The opinions are my own. Thank you for letting me be a part of the tour!I loved it! You can be sure that I'll be checking out your other books too! Hmmmm, despite the issues you had with the religious aspect, I'm still pretty interested in this one. Fantastic review as ALWAYS, Gabby! You're so succinct yet you manage to let us know if you liked the book.